Subtle shapes of letters peek out from British designer Jasper Morrison's newly expanded T&O furniture collection for Japanese brand Maruni. 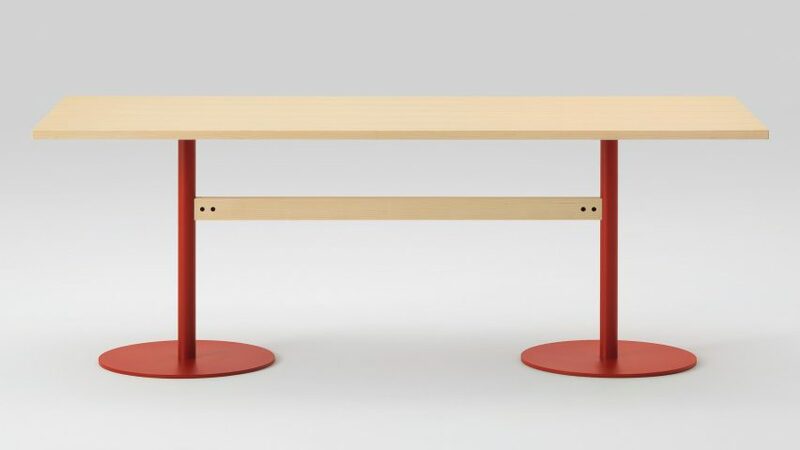 Morrison has added a pair of tables to the range, both featuring painted steel elements. They were revealed at Salone del Mobile in April. 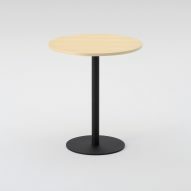 His rectangular T&O table sits on red steel legs with circular bases, and a smaller circular table is supported by a similarly shaped metal stem. "There's nothing unusual about using wood and steel together, but I realised by using it in the middle of the chair between wooden parts and with colour, it would bring something fresh to this typology of chair," Morrison told Dezeen. The T&O collection is named for its resemblance to the two letters, with the crossbar of the T and the roundness and counter of the O reflected in the table and chair he first designed for the range, in 2016. Both of these pieces are now also available in ash. "I like the way the round base contrasts the square tops, and the way the legs of the longer tables are joined with a wooden bar so that the metal is between wooden elements," added Morrison. "I think it can work at home or in certain kinds of cafe. I saw some in a Tsutaya bookstore in Japan recently." The British designer, who has been working with Maruni since 2011, has also created a wood-framed bench-like sofa for the brand. Widely considered one of the world's best industrial designers, Morrison studied at both Kingston Polytechnic and the Royal College of Art in London, setting up his studio in 2008. It now also has offices in Tokyo and Paris. He is known for his "super normal" aesthetic, and his designs have been produced by Aram, SCP and Cappellini, among others. As well as serving as art director at Swiss electronics company Punkt, Morrison has recently designed sandals for Camper, furniture for Vitra and a prefab cabin for Muji. Morrison ranked fifth among designers on Dezeen Hot List, a data-generated power ranking of the industry's most influential people and brands.